I made this quilt for my grandson as he transitions from crib to twin bed. It's a one-block-wonder, made of about 1000 60-degree, fussy-cut triangles. "All I ask is a tall ship and a star to steer her by." For those of you who are interested, there are several books available with instructions to make a One Block Wonder. You can find them here. You can find the full text of the poem here. Peaches- I had this quilted in black, which faded into the blocks. I've seen one-block wonders quilted 1/4" from the seams, and also with a scallop pattern around each triangle. This looks good to me and keeps it simple. I think the quilting needs to reflect the all over idea for the quilt, so, even in a quilt this complicated looking, might also be a complicated pattern. 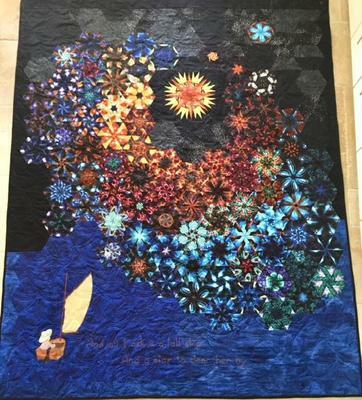 Absolutely gorgeous quilt! I've made several One Block Wonder quilt tops. Love the idea of creating different variations of blocks. Sometimes I even carry 2 mirrors to the fabric store to see which materials best for this technique. As for the quilt tops, I haven't figured out which style of quilting will work best for such a busy pattern. Nanette, This is one of the easiest quilts I've ever made! Two parts required patience. One was stacking 6 layers of fabric just right so you end up with 6 identical triangles. The second tricky part was laying all the half hexagons out to form a good design. I used a template to cut the triangles so they were all the same size. Sewing the whole thing together was a snap. Maxine Rosenthal and Linda Bardes have a book out with excellent instructions- "One-Block Wonders of the World". So beautiful. I want to make a one block wonder but can't find the nerve to try. This is an awesome quilt for a child to grow with. Really beautiful. I think you should save it until he gets married, as little boys can be rough on quilts. This is absolutely fabulous. I love your creativity in using the One Block Wonder to represent the stars in the sky. Magnificient!